Still cooking, posting over at redhookcsa.com. More posts over here, eventually. 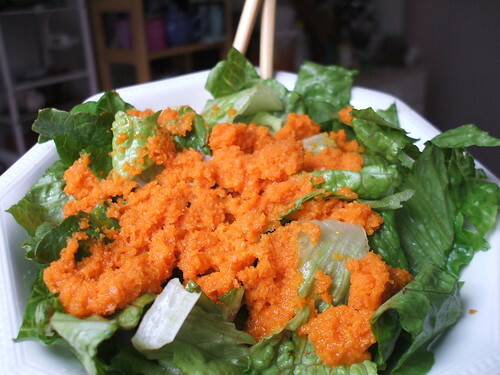 You know the default salad dressing at most Japanese restaurants, the sweet golden emulsion of carrots and ginger that’s so perfect on a bed of lettuce? I can’t get enough of it. I often wish it were appropriate to eat this salad dressing on its own, but the usual recipe is secretly full of oil and added sugar, which doesn’t make me feel so great. I’ve adapted a lighter version of my favorite salad dressing, and it’s healthy enough to eat as a salad. If you’re planning to serve it over lettuce, make it a bit thinner. Make it a little thicker to serve on its own. 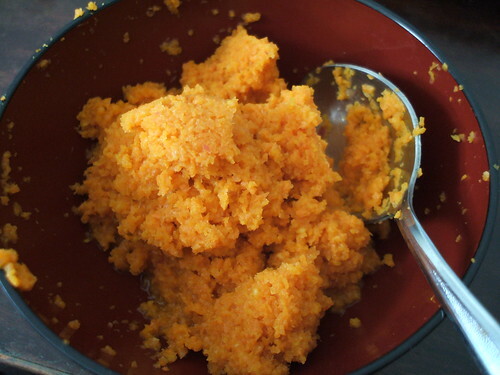 You can also follow the variation below for a shredded carrot salad. I’ve been making my own at home expressly for the purpose of eating it by the bowlful. And sometimes, I even mix in a bit of lettuce. If your carrots are especially fresh and tender, you won’t need to peel them. Just trim off the tops, cut into chunks, and toss into your food processor along with the ginger and shallots. Process until mostly chunky, then add the soy sauce, rice vinegar, and sesame oil and process until smooth, stopping to scrape the sides and bottom of the bowl a few times. Add water a little at a time while the processor is running. You might not need all the water, depending on the moisture level of your carrots. If the texture is too thick, add a bit more water and process again. And remember, I’m already omitting a cup of canola oil, so you can use some of that in place of the oil. 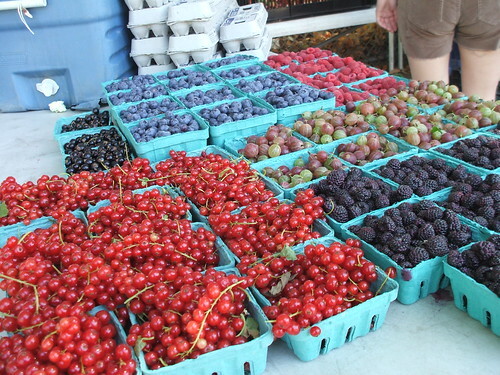 Refrigerate one hour to allow flavors to meld, if you can wait that long. Then serve over lettuce, or just spoon it up. This dressing can be used for about two weeks, but it will lose some of its fresh flavor after a few days. Variation: If you’re looking for a Frenchier version of this salad, grate carrots on a box grater for fluffy texture. Mince shallots. 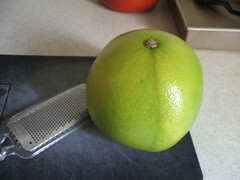 Grate ginger (easier if it’s frozen) on a Microplane. Mix all ingredients together. This is the same attitude that always led me to raft down the Columbia River when playing Oregon Trail. Usually, I ended up with drowned oxen and a broken axle, but sometimes that pixellated covered wagon pulled through. That’s what keeps me going. So I’m testing out a bunch of bagel recipes and techniques in hopes that I’ll eventually find a combination that will get me through. At least this time no virtual lives are at stake. 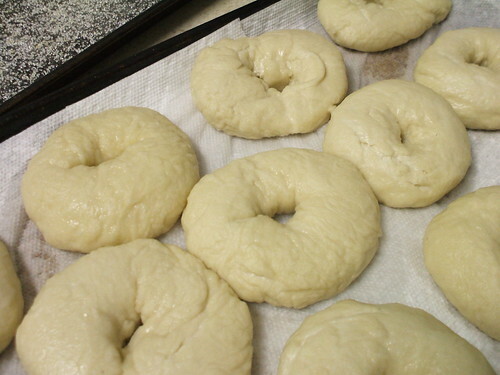 If you have a tried-and-true bagel recipe, pass it on! Hi there. It’s been a while, but I’m back. I’m not here to scatter handfuls from my bushel of excuses on lack of posting over the past month–that’s so 2005. Instead, I’ve got more posts that involve acutal cooking and pretty pictures of food. About time, right? I’ve recently partnered with a certain Ian to get into some healthier habits. I haven’t been very interested in cooking lately, and I feel like everthing I eat comes out of a crackly plastic bag. Sloppy nutrition makes me tired and I don’t want to cook when I’m tired, so I end up in a not-too-pleasant cycle. So in order to feel better, and feel better about myself, I’m going to concentrate on cooking healthy foods more often. I’m a bit of an amateur nutrition buff, so I’ll be writing about the health benefits of the things I cook. Dessert lovers, don’t worry–this isn’t going to become a shame-dispensing health site. I promise only to share the most delicious recipes and ingredients, including plenty of cookies, jam, custard, and ice cream. That said, I’m turning over a new leaf–literally (you knew that joke was coming). 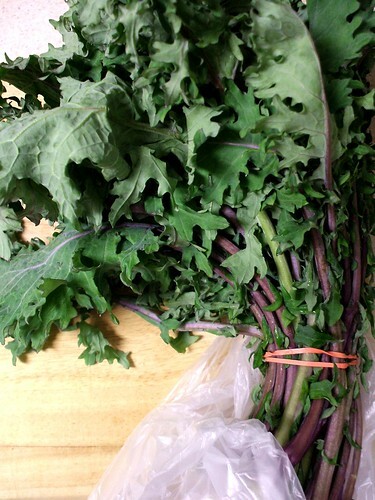 This bundle of joy is Red Russian Kale, one of my favorite leafy greens. It’s much milder than other kales, and one of the prettiest brassicas around. When it’s young like this bunch, you barely need to cook it at all, and it could even serve as a salad green once de-stemmed, or shredded in a delicate slaw. The leaves are so tender I couldn’t stop myself from taking a bite of one on the way home, even though I prefer them sauteed. 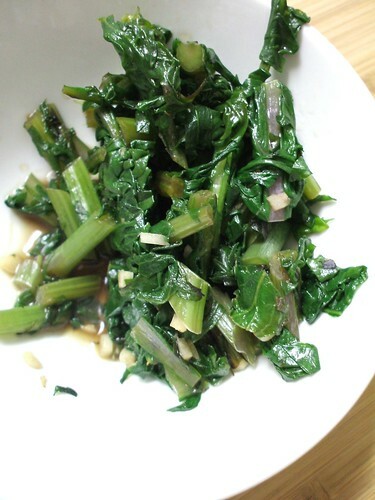 I cooked this kale the way I cook most leafy greens. Just a quick stir fry with some oil (about 2 Tbs) and a minced clove of garlic, and it’s ready to go. I chop everything up, heat the oil on high, toss in the stems, stir about 2 minutes, add the leaves, stir for 2 minutes, add the garlic, & stir 2 more minutes. Everyone knows that the dark green leafies contain lots of iron, calcium, manganese and vitamins A, C , and K. But did you know that they fight cancer and aid brain function? Dark brassicas are commonly used as a liver detoxifier; high fiber content means they cleanse the colon as well. That brings to mind their high sulfur content (it’s why they smell a bit like an unlit match as you cook them), a clever inclusion gives them slight antimicrobial properties. But forget about all that for a minute, and listen when I tell you that they are delicious. Cooked in a little oil, with some garlic and maybe a bit of red pepper, these greens are soft, rich, fresh, and nourishing. I don’t salt them because their mineral content makes them taste salty enough. And you know, for health. These might be just the thing to wean me off of my Peanut m&m habit. So here’s to the new me, the new you, and the new crop of kale. Consider this new leaf flipped. Now that we’re in the midst of citrus season, I’m a bit overwhelmed by the bounty. Don’t get me wrong, I love every last one of those tart and juicy treats, but sometimes I run out of things to make with them. So far this winter, I’ve made marmalade, candied peel, cakes, cookies, sorbets – I don’t even know what else – from the lemons, limes, tangerines, oranges and grapefruit that pop up at every turn. I thought I was tired of citrus season, but when I saw pummelos in my local grocery store, I couldn’t pass them up. Pummelos should be golden and these were a little under-ripe, but I brought home one of the giant green orbs and devised a use for it. 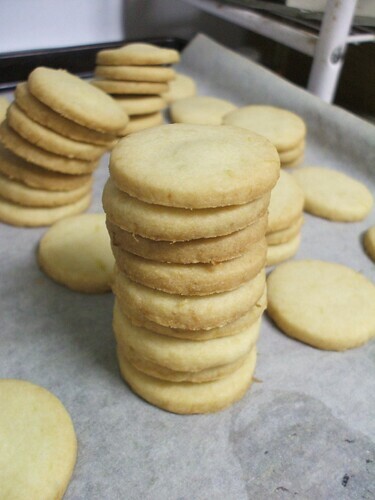 It smelled lovely – floral and bright – so I put its zest into a quick batch of shortbread. And though it dwarfed my zester and strained my wrist, the gentle giant proved just the right match for these delicate shortbread coins. So now that my love for citrus is rekindled, I’m starting to remember all the favorite foods I can only make this time of year. Berries can wait, I still have to make blood orange sorbet, meyer lemon curd, and grapefruit pound cake before the season ends. In the bowl of a stand mixer (or use a sturdy wooden spoon), combine all ingredients. Mix on low speed until everything comes together in a smooth dough. Do not overmix. Form dough into a flat block and refrigerate 15 minutes. Preheat oven to 325 and line 2 baking sheets with parchement paper. Roll out dough 1/4-inch thick and cut into desired shapes. I couldn’t find my cookie cutters, so I used a shot glass to make little circles. Arrange cookies on sheets and pop into the freezer for about 10 minutes. This helps them hold their shape in the oven. Bake straight from the freezer 8-10 minutes, or until just golden at the edges. That’s right, kids, the age-old mushroom joke has hit grocery store shelves. 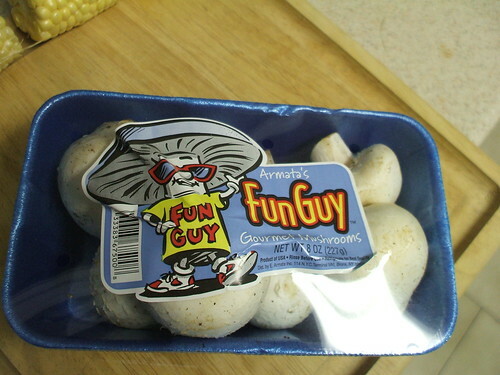 Passed down through the ages by science teachers and other assorted nerds, the “I’m a fun guy” punchline has finally reached its full marketing potential. At least, the packaging induced my roommate to buy these. No word on whether they taste more fun (or “gourmet”) than regular old button mushrooms. Has anyone else seen these or other jokey vegetables in local stores? That’s right kids, corn spaghetti. I dabble in gluten-free cookery from time to time, as I’m slightly sensitive to the stretchy stuff. Usually I feel tired, bloated, and cranky when I’ve had more than a little gluten, so I keep it to a minimum. That means I’m always trying new GF products and recipes. 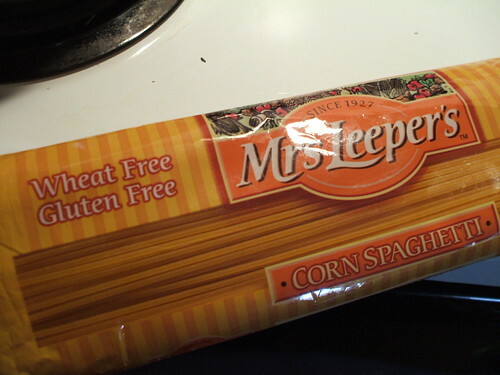 I got this corn spaghetti at Whole Foods, so I’m sure it’s pretty widely available. It cooks up just like any other pasta, and it’s surprisingly mild. The taste is reminiscent of corn tortillas, but since it’s cooked in water, it doesn’t have the distinct taco taste. My first dish with this was simply dressed with a little olive oil, salt, and red pepper. I can imagine it would be great in sopa seca, the Mexican noodle casserole. It would also be good in a take on Shanghai pan-fried noodles, or anything else that features fried noodles. I’d totally buy this again, and I’ll keep you posted when I make a more complex recipe with it. 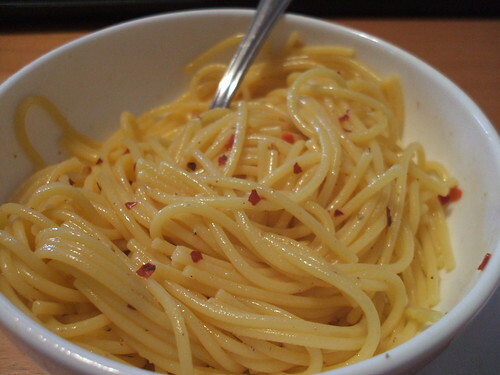 Has anyone else tried corn spaghetti? What did you think?